An engagement ring is a token of love and commitment. It tells the world you have agreed to marry your beloved. In an ideal world, you get married and live happily ever after. But with half of all marriages ending in divorce, and many engaged couples not even making it to the ceremony, it is worth knowing what happens to the ring if your engagement ends or your marriage subsequently collapses in a firestorm of acrimonious recriminations. Etiquette is a code of polite behavior. You are not obliged to follow the rules of etiquette, but it will be expected of you in some circles. In the world of matrimony, there are a few unspoken rules pertaining to engagement ring etiquette. If a couple’s engagement ends and it’s a friendly split, either party can keep the ring, but if the man ends the engagement, perhaps because he met someone else or was caught on camera with a stripper on his groom’s night, the woman is entitled to hang on to the engagement ring. When the woman ends the engagement for whatever reason, she is expected to return the ring to the man. Some men like to give their prospective bride a valuable heirloom engagement ring. Such a ring will come with inherited stories and often carries a lot of significance. 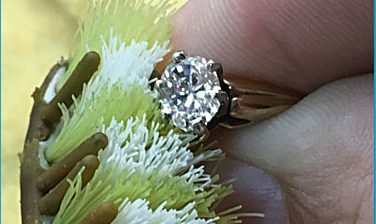 This is a very personal gift and many women will be delighted to receive such a treasured engagement ring, but it makes the end of an engagement or marriage rather tricky. Unless there is a good reason for the woman to keep the ring, it is customary to give an heirloom engagement ring back to the man when the relationship ends. Since this ring has possibly been in his family for several generations, the family will want to keep it. This is, of course, negotiable; for example, if your ex agrees that the ring should be passed on to your shared children. 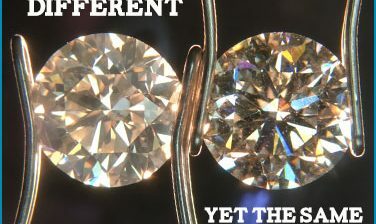 But don’t assume this is the case – talk it through before you rush off to the nearest pawnbroker or jeweler. There is legislation to protect both parties when a relationship ends. 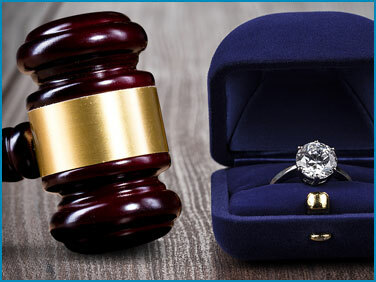 Some of this legislation pertains to what happens to an engagement ring. 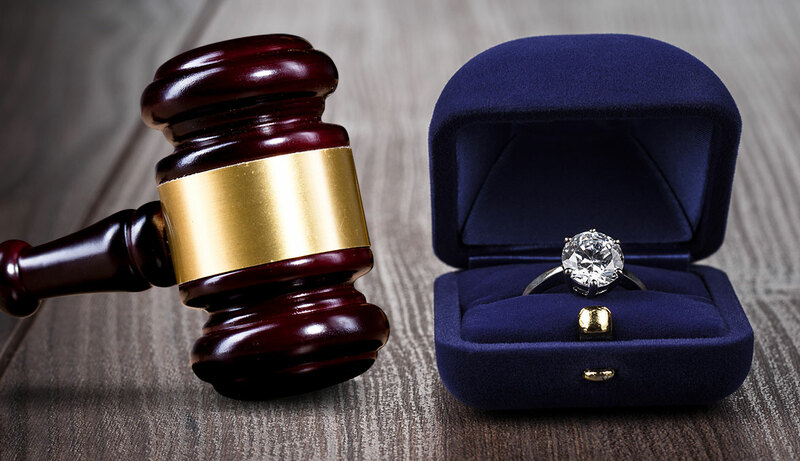 For specific advice, always consult a lawyer specializing in family law, but an overview of the legalities in who gets to keep the ring is outlined below. An engagement ring is classed as a completed or conditional gift. A completed gift is when there is a clear intention to give an engagement ring as a gift and it is accepted as such. This all sounds straightforward. After all, of course, an engagement ring is a gift! It’s not like you want it back, right? Well, here’s where the water muddies a bit. Most courts class engagement rings as a conditional gift. That is, until the wedding takes place, the person giving the engagement ring has a right to ask for the ring back. The court won’t be interested if you try to argue that accepting the proposal means the gift is complete. Most courts won’t allow this argument to stand. There are also some instances where the balance is tipped in either direction. In Pavlicic v. Vogtsberger, a love-struck man proposed marriage to his fiancée. He gave her some cash to start a business, bought her a house and cars, as well as a lovely ring. She then skipped town and married another man. The man took her to court and his runaway fiancée was ordered to give back all the gifts, including the engagement ring. In a different case, a woman accepted an expensive engagement ring and agreed to work for the fiancée’s business, as well as give him money, all in anticipation of the marriage. When the fiancée ended the engagement, the woman was allowed to keep the ring, as it was classed as ‘compensation’. It’s understandable that the end of an engagement or marriage is a time of high emotions, but try to avoid conflict where the ring is concerned. If the engagement ring is very valuable, the man will usually expect the woman to give it back. However, you may feel you have grounds to keep it, so sit down and talk it through, and if you can’t come to an agreement, seek legal advice. Once you two have skipped down the aisle and are officially man and wife, the legal situation changes, and that engagement ring now belongs to the wife and is hers to keep. If this is your situation, you can store your ring in a drawer, give it to your children as a keepsake, or even sell the diamond ring. 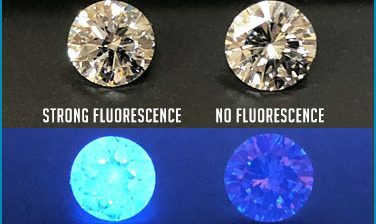 There is a market for used engagement rings, but don’t expect to receive the original purchase price. For a no-strings valuation, talk to us today.